Encouraging high schoolers isn’t the easiest job in the world. But, rule of thumb, papering the school with lists of what “Black and Latina Girls Should Know” and including things like “wearing too much makeup looks like a clown” likely won’t go over so well. “There are some things that should not be said at all,” said another student Christina Arzate. Those things included statements like: Wearing too much makeup looks like a clown. Twerkin’ and grinding ain’t cute. Experience holding a book (not a kindle or reading on the Internet) this is so important for you to remember how far you have come as Black and Brown people. “That’s highly offensive, that’s pretty derogatory toward very specific groups of people,” student Victor Corrl said. 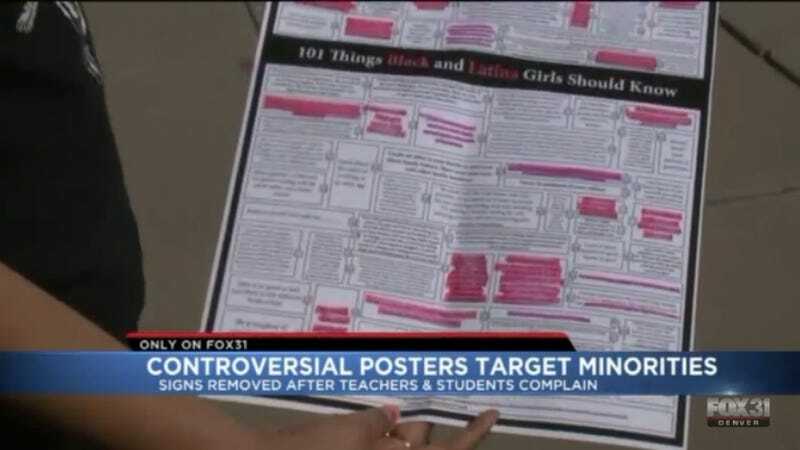 Fox31 talked to a child psychologist who said that many of the messages on the posters were upbeat and positive, but, “the percentage of kids getting something from this, who will think twice about their hygiene or appearance, I think is much less than if they thought more carefully regarding the sensitivity on the delivery of it.” No kidding! On the bright side, students now have a great example of the importance of thinking very carefully before you speak, to which they can turn in times of uncertainty.